Jet Fighter Flight Simulator in Virtual Reality - Mission for 2 persons. Be the first to live this new unique experience. Package good for TWO person in simultaneous missions. You have always dreamed to be in command of a jet fighter. Here is your chance to live the sensations of a perilous fighter mission. Fly at full speed into the sky. Maybe you`ll be able to reproduce mythical scene of Hollywood movies ! Recreational Flight now offers you to fulfill your dream with the new Virtual Reality Jet Fighter Simulators. This unique experience in Canada is based on the US Air-Force training simulator. Get aboard a replica of a real fighter cockpit with the ejection seat and all the equipment of a real combat pilot. Wear the pilot suit and helmet, smell the odor of the combat airplane. You will live a multi-sensory immersive experience aboard a Mig 29, a Sukoi-27, a F-15 Eagle, a F/A 18C Hornet, etc ! Two persons at the time can participate in a mission. Each person is flying his own Fighter airplane. 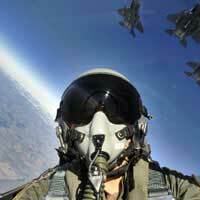 The groups of friends or coworkers participate two by two and can evaluate their Top Gun pilots capacities. The record man will have the privilege to carry the famous Top Gun Cup! Minimum age of 14 years old.